I’m going to out myself as an actual geek here and admit that I love shortwave radio. My honey and I have a Grundig S350, and since we weren’t up to huge New Year’s festivities this year, we tuned in to hear the year turn, around the world, via shortwave. We opened the first bottle of champagne as Big Ben rang in London, then we tried to track the midnight line as it moved west – Burkina Faso, Ivory Coast, Mali, Brazil, Argentina, Venezuela, Colombia, Ecuador, Peru. Didn’t have a lot of luck DXing, so we listened to Radio Habana Cuba most of the night. The DJ mixed stories about the 30th anniversary of the Bay of Pigs invasion with son, rumba, cuban jazz, and reggaeton while we drank Auld Lang cocktails and traded resolutions. 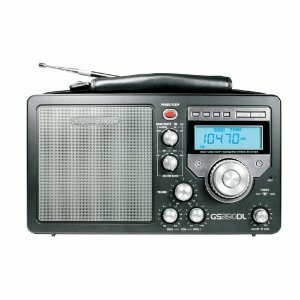 Shortwave sets are cheap and widely available just about everywhere in the world. A low power, low cost, difficult to censor medium, it is incredibly popular in developing countries and under repressive regimes. Shortwave is more like the internet than the internet. Shortwave frequencies can reach just about anywhere on earth because they are short waves (hence the name) and ultra bouncy. They just zing off the ionosphere and POW! You’re listening to China, or Radio Oman, or Brother Stair from Walterboro, South Carolina. To listen, it’s best to be in a clear area — the woods, a mountaintop — and to wait until night. Shortwave is a medium of secret confidences. It feels like eavesdropping. It’s an intimate, clandestine thrill. You can listen in to your neighbors, to far-flung countries, to the universe itself. That computer voice reciting a sequence numbers? Spies use those to decode messages, still. That regular clicking sound? It’s not a clock – it’s a quasar, the most energetic object in the universe. That fuzz and hiss? That sound like popcorn? Could be an ATM down the block, could be a solar flare. Next Next post: A Sputnik moment?